One of our biggest challenges in working with a team is keeping people motivated when things get hard. Why does one person work themselves into the ground doing far more work than is necessary, while another spends hours on anything other than the thing they are supposed to do? Why does one sail along taking it all in their stride while another throws their hands in the air, declares it impossible and has a complete meltdown? Is it just that some people aren’t very good? People respond differently to stress and it has nothing to do with intelligence or skill. Very skilled people may still lack confidence in their ability to complete a task. In situations where people have to deliver something, people are balancing out their desire to do something well (success orientation) with their worries of getting it wrong (fear of failure). An Overstriver has high success orientation and high fear of failure. They lack confidence so keep working long after value has been achieved. As a result, they are likely to burn themselves out and lack resilience when they hit problems. Someone with a high success orientation and low fear of failure is an Optimist. They are in the ideal place on this model as they are confident that their effort will produce the result they want. They show resilience and are unlikely to show defensive behaviours. Self-Protectors have a high fear of failure and a low success orientation. Rather than trying to prevent failure, they find external reasons to justify a lack of performance. For example, other people not having done something, insufficient time or a system they need not being available. Anything. Out the 4 groups of characteristics, people showing these are likely to have the worst outcomes. Those with low fear of failure and low success orientation are Failure Acceptors. They expect very little of themselves and are seemingly indifferent to both their successes and failures. Do you recognise yourself, or any of your team here? How do people try and protect themselves? The thing is, however unmotivated some appear, everyone likes to look competent and capable to their peers. To keep up this appearance people use two main strategies to protect them from feeling foolish in front of colleagues. Over Strivers and Self Protectors show high levels of defensive pessimism. They lower their expectations of what they can achieve and anticipate they will fail as a way of protecting themselves against disappointment. Any success is treated as a pleasant surprise. Failure Acceptors will often self-handicap. An example of this is leaving a task so late that they don’t have the time to complete it. They can blame that for the resulting failure rather than themselves. The problem with these strategies on a personal level is that over time they actually reinforce the behaviour people are trying to avoid. Expecting to fail becomes normal so people feel helpless and believe they can’t improve. Neither do they help the project. Although people look busy the project is still affected by poor quality deliverables and ever extending timelines. Which ultimately leads to dissatisfied customers! What can you do as a team lead? One thing is clear, asking people to try harder doesn’t work. It actually makes matters worse as it increases the fear of failure of people who already don’t believe they’re capable of succeeding. 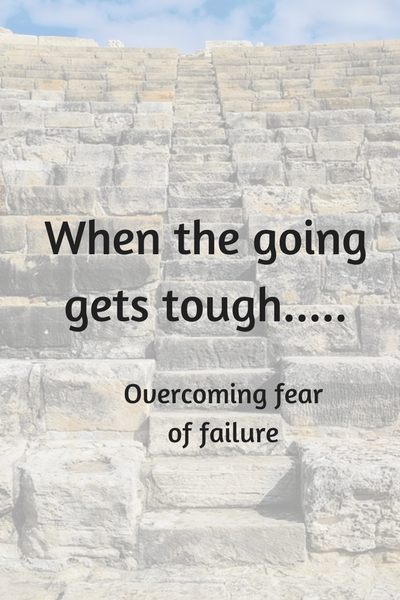 Team members with a high fear of failure benefit from breaking down work into small, manageable chunks. This prevents them feeling overwhelmed and helps them stay on track. Support team members with a low success orientation by identifying where they have succeeded in the past. When they say they can’t do something, remind them of past achievements. Demonstrating that they are capable of succeeding builds their confidence. 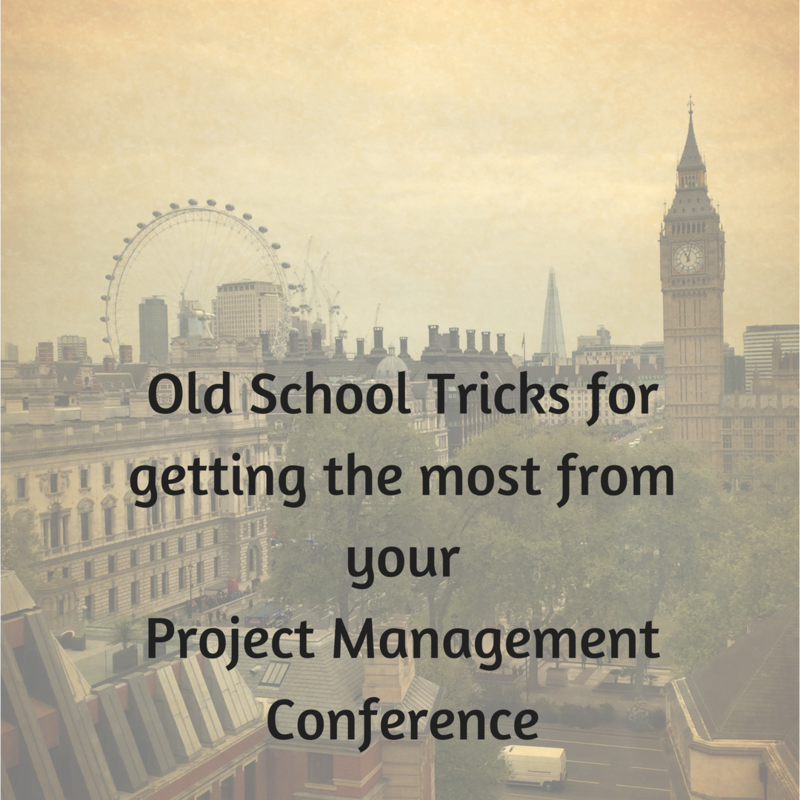 At the recent Ground Control conference, I was talking to some digital project managers who were saying how much they valued the conference, how enlightening it was to talk with other project managers and how important such self-development is, but also how difficult it is to get the space to do it. Even while they were there, their project teams were ringing them up to deal with issues. How could they make the most of it? It’s the well-known curse of the smartphone. A useful tool in helping you work, and the flip side is you carry your work around with you everywhere. They replied, “Well, you have to put somebody in charge. You have to delegate so somebody is responsible, but also, if you’re not there to answer questions, people will just get on with it. They have to solve the problem themselves and that’s how they learn and develop. 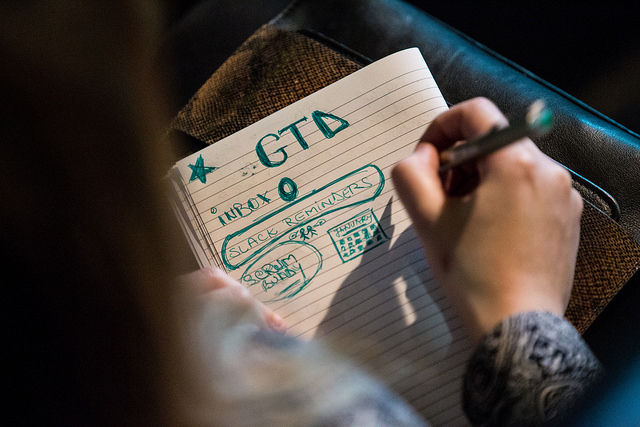 How do you set yourself up for a good conference? Firstly, you know your conference is coming up, so plan for it. Where you have the choice, don’t schedule a huge release for the day before you’re due to go. Don’t plan critical meetings that require huge amounts of preparation. Simply put, don’t create a situation which is going to need a lot of your time the day you are away. Set yourself up for a day with no anticipated issues. Emergencies may happen. They do, but where you can move key milestones away from the days before and after your conference, do it. Secondly. Communicate. Make sure that you are not the only person who knows where key information is. Everybody needs to be aware of how the project is being run and what needs to happen next. Don’t let the team become dependent on you. They’re all capable people. Let everybody know where the key information is without having to ask you every time. Then trust your team. When you go, delegate to someone and tell the rest of the team, “X is covering project management questions today.” Let these people know what is expected and give them an escalation route in case of issues. Make sure they are briefed and know what to do. Finally, if anything does go wrong and somebody makes a decision that’s less than optimal, don’t blame them for it. It’s a learning. Just deal with it when you get back. One of the hardest things though is letting go. It can feel good to be wanted and indispensable and you have to make sure that you make yourself unavailable. Don’t read your work e-mails. Put your out of office on. Don’t read your work slack channel. Let someone know the 1 way they can contact you in a real emergency. Whatever you do, don’t say to your team, “Oh, if you need me, just contact me.” People generally take the line of least resistance, and if they think they can contact you to answer a trivial question, then they will. If one of your goals is developing your team then turning off your smartphone may be one of the best things you can do. Enjoy your conference! I hope you learn something really useful. 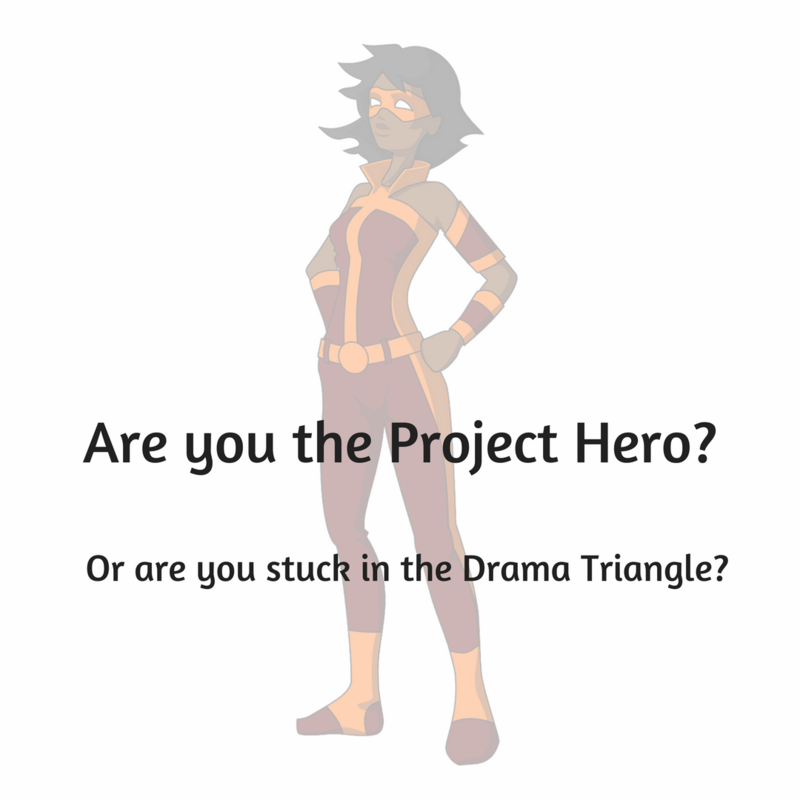 Are you the Project Hero? Or are you stuck in the Drama Triangle? As a project manager or lead BA do you ever find yourself stuck in this role? There is conflict between other members of the team and you feel you must go and sort things out for them. This plays out over and over again and you wonder if you have turned into some kind of project referee. 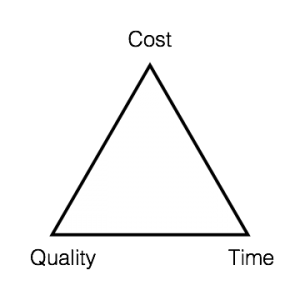 It’s more likely that you are the Hero in the drama triangle. The Drama Triangle is one of those useful models that sneaks up on me every often. I watch situations at work and think “Why does Bob always have to get involved in Dav’s arguments” or “How come I’m the baddie when I was just asking a question?” or “Let me just go and sort those two out again….” and I realise that the drama triangle is playing out. So, what is the drama triangle? The Drama Triangle, or more accurately Karpman’s drama triangle is a model that describes three roles that three people take in an argument. These have various names but I call them the Hero, the Victim and the Aggressor. These three roles are self-sustaining and need each other to survive. I find it a really insightful way of looking at interactions between 3 people, especially when someone (maybe even me!) always seems to be getting involved in situations that seem no business of theirs. The Hero protects the Victim against the Aggressor. They step in when they see the Victim is unable to defend themselves. Some people love to play the hero. They love being seen to save the day and make everything alright. It gives them a sense of worth. The Victim is attacked by the aggressor and wants a Hero to save them as they can’t, or won’t, do it themselves. Some people like to see themselves as victims in many circumstances and draw people in as aggressors and heroes, whether they want to play that role or not. The Aggressor attacks the Victim and is only stopped by someone else coming in as Hero. Some people find other people’s vulnerability very hard to deal with and so go in as an aggressor by default. A huge downside of the Drama Triangle is that the two people with the disagreement do not learn how to resolve things between them. A particular situation is fixed but there is an underlying sense of injustice. The stage is set for a similar dispute the next time there is a difference of opinion. We find ourselves in Drama Triangles for a couple of reasons. Firstly, the simple reason that people like patterns. So we approach new problems the same way that we have in the past. We just fall into it without thinking. Secondly, we get dragged into a triangle, often by a Victim. We then find ourselves mired in the situation before we have had a chance to work out what is going on. Conflict happens, people disagree. Problem-solving is about exploring different ways of doing things and when you are in a team then you need to explore those together. The ideal situation is that everyone behaves as competent adults. They solve the problem and move on. Nothing to see here. How to stop being a Hero. To break out of this role you must help the victim and the aggressor to sort out the problem between them. Not do it for them. Sometimes you need to know when to step away. The triangle can only play out of the 3 people stay involved. If you refuse to be a hero. 1) Is this actually any of my business or could, and should, the two parties sort this out between them? 2) Am I really helping here or am I here just to make myself feel or look good? Your input may still be needed, but in a helping or coaching capacity, rather than a “let me do it all for you” way. Am I doing my user stories right? The team aren’t getting it. 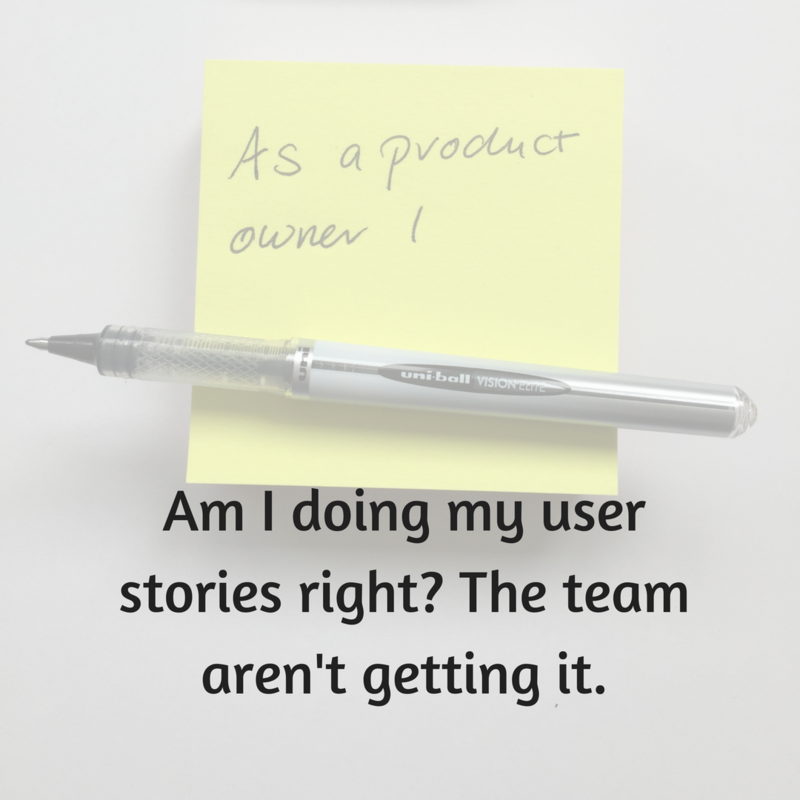 Recently I was working with a BA to explore why the user stories she is creating are not being followed by some of her team. She is in the situation many people in large organisations are in. She is in an Agile team where part of the team is co-located with the users in the UK and part of the team (frequently developers) are members of another organisation and located in another country. Commonly referred to as offshore partners. In her project she is writing stories then discussing with her offshore team to explain them. She gives the team as much opportunity as possible to ask questions and say where they don’t understand. But they are not fulfilling them, They are overworking the solution and doing things not in the story. She is spending many hours going back re-writing stories and re-explaining them, as her belief is that the problem is she isn’t being clear enough. All she has to do is explain them better and they will understand. So she came to me, in some frustration to ask me to review her stories. I reviewed the stories she had written; the clarity of the language, the size, the acceptance criteria, the features and epics they were part of. They were excellent. Exemplars of good practice. But still, the team was not fulfilling them. They were overworking the solution. What matters to your team? We all work on assumptions. One big assumption we have is that other people see the world in the same way that we do. It is an assumption that, for the most part, works. It allows us to interact easily with people on a day to day basis. However, if you are having difficulty communicating well with someone it is worth challenging this very basic idea. While you are all part of the same team, the measures of success of an offshore partner are not, necessarily the same as that of your company. If some of your team have other priorities then they will fulfil those in preference to team goals. So we discussed a number or areas. What is important to them? What are they being measured by? Was Agile working written into the contract in the first place? What are the SLA’s? The offshore team is based in India and working across cultures can be tricky. Companies have cultures, countries have cultures. 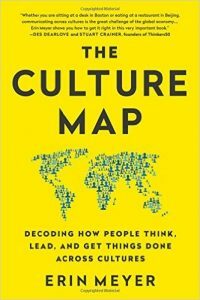 I showed her my new favourite book on working across cultures, Erin Meyer’s The Culture Map and we had a look at a couple of the areas where UK and Indian cultures differ. Disagreeing with a client is hard. In the UK, we do everything we can not to say ‘No’ to a client but within teams we value different opinions about how to get things done. In Indian culture, disagreement is seen as negative for a team and adversely affecting relationships. 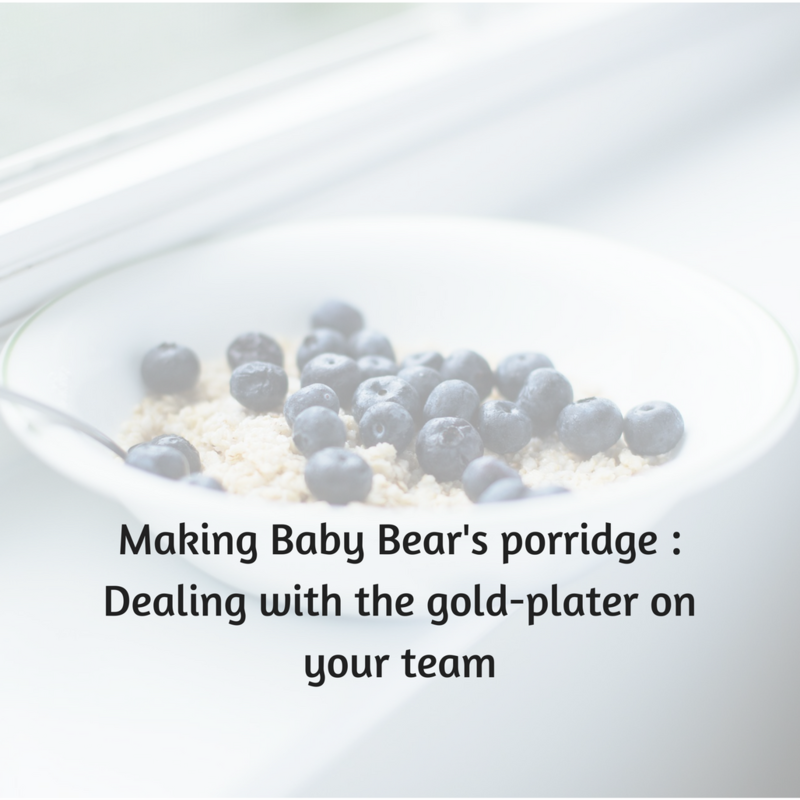 Offshore team members are going to find it very difficult to challenge you, their client, in the first place. Being expected to do this is a group environment makes it harder. The thing that worked for this BA was taking discussions out of the group environment and into one-to-one conversations. That took the pressure off people who didn’t want to disagree in a team environment and she could then get to any underlying issues. She has now changed some of the ways the team works and things are improving. The lesson here is that, if something isn’t working don’t keep on trying to improve your current way of working forever. Different is not a synonym for wrong and it is good to take a step back and look for a different way of addressing your issues. A fresh approach can bring surprising results. My interest in change management and behaviour started with my very first IT project. Although the Project manager said the users wanted a new tool, just putting it out there meant it was ignored. At first, I couldn’t understand this. I thought it was a case of ‘build it and they will come!’. Then I realised there was something a little more subtle going on. Projects are about change. They are the mechanism we use in business to make new things happen. The project ideal is that someone comes up with an idea to improve the company. For example by making the company more efficient, increasing revenue or cutting costs. A project it set up to implement the idea. When the project finishes, the company is doing things differently and this is better than before. However, as with all things, once people get involved; real people with feelings and interests and other opinions, then the process doesn’t flow quite as freely as the story implies. Change is a personal thing. Some people like it some people hate it. Some people believe one approach is good, whereas others believe it is awful. But in business, as in life, everyone to be got to the same end point. 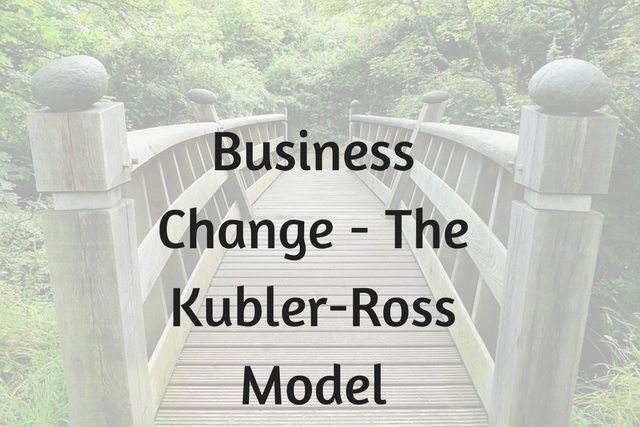 One way of looking at organisational change is the Kübler-Ross change curve. In the 1960’s Elizabeth Kübler-Ross developed her stages of grief model after observing the behaviour of people diagnosed with a terminal illness. Initially a model for helping dying patients to cope with death and bereavement, it also provides insight on how people come to terms with any change. 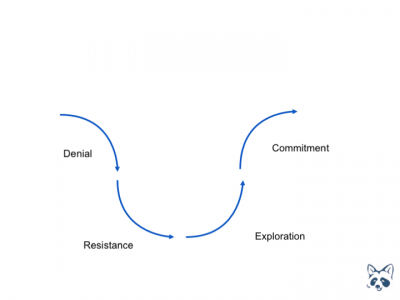 This model has been adopted by business as it parallels the emotions that people feel when they experience events like reorganisations at work. As with all models, it is an approximation of what an individual experiences, not a set of rigid instructions. Here is a simplified version of the curve describing the common stages that people go through. Disbelief – faced with an upcoming change many people’s immediate response is to reject it and deny that it will happen. Resistance – once they accept the change people often see if they can resist or prevent it. Exploration – as the change become more real, people start to think how it might work for them and what the implications mean to them. Commitment – people commit to the change and it becomes part of their daily life. In most situations, people progress through these stages. They may move through them quickly or slowly depending on the magnitude of the change and how much they want it. For example, a website redesign will get very different responses than a redundancy announcement. Someone who is driving a project has a very different response to someone who does not think it is necessary. Understand that disbelief and resistance are very common reactions and should not be dismissed as someone being unreasonable. 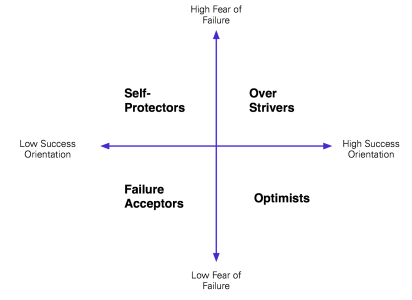 One of the key features of the curve is the dip in the middle of it. That indicates how people can experience a loss in effectiveness while they learn new ways. In an ideal project, people will be more effective after a change than before, but if it fails, or if a person cannot move to the stage where they explore and accept a new approach then efficiency may be permanently lowered. There are two types of change. 1 One that can be knocked off course. These are the most common sorts of change usually to do with the introduction of new systems or ways of working. Understanding that people will have different responses and that it will not all be plain sailing from day 1 will help your change stick. A change programme will help people get through smoothly and easily, minimising the ‘dip’ in the middle. You can help people by anticipating some of their reasons for resistance and helping them explore options so they can understand what it might mean for them and how they can work with it. 2 One that is inevitable. These are rarer but can be very significant. An example is a merger with another company. Understanding that people will have different responses and that it may be both painful and difficult for some people means that the change can go through with the least amount of disruption and difficulty. A change programme also ensures that people who are negatively impacted are treated with respect. In both cases, an effective change programme means a business realises the benefits as quickly as possible. Do you find change is properly managed where you work, or is there an element of hoping everything will turn out OK? I am coming across lots of articles waxing lyrical about how virtual assistants like Alexa or Cortana will change our lives, the way we interact with computers, companies and each other. These devices are incredibly popular and it is assumed they will become common in most households much in the way smartphones have. Am I really the only person to think “I’m not having one of those in my house!”? Computers that we talk to have long been a staple of science fiction. From Hal in 2001, to ORAC in Blake’s 7, to Holly in Red Dwarf. In none of these stories, however, is the computer sending back everything it heard to a commercial company whose primary driver is making as much money as it can. The big difference between the new virtual assistants and existing voice-activated smartphones is that the VAs are listening All. The. Time. They say they are currently not recording anything you say before that, but they are still aware of it. What are they doing with what they hear? A very good question. I’m sure it tells you in the Terms and Conditions. You’ve read them, right? I am surprised if you have. A few years ago someone calculated that it would take the average person 76 days to read all the terms and conditions they’ve signed up to. That assumes that they are sitting there reading for 8 hours a day. How many people can put their hand on their heart and say they have done this? Not very many at all…. So what that means in practice is that most of us don’t have a clue what we have agreed that companies can do with our data. We just vaguely trust that they are going to do the decent thing. Our data is being stored, as, certainly with Alexa, you can go and listen to the requests you have made. We already we get targeted advertisements based on what these systems know about us. But what else is this data being used for? For example, have you heard of the Investigative Powers Act 2016? You know, the law that, among other things, requires UK internet providers to store browsing histories for one year. The law declared illegal by the ECJ as it is indiscriminate? Is that what you want? Every idle thought that crossed your mind that you asked Alexa about? Every joke present for a friend? Layable before the police for them to make of what they will? The thing George Orwell got wrong in 1984 was not the level of surveillance that people could be under but that a way would be found to make us adopt it ourselves rather than having it imposed upon us. There has never been such a highly surveilled society before. If the government ordered us all to carry tracking devices with us where ever we go there would (probably) have been uproar. As it is, huge numbers of us carry our phones with location tracking on. Guess what, it’s the same. There is a record of everywhere we go. It’s available to huge multi-nationals and it’s available to the government. We get comfortable, we accept these things into our lives and then it never occurs to us to turn them off. I am a huge believer in privacy. Some people say that if you are doing nothing wrong then you have nothing to fear. I disagree. If you are doing nothing wrong then it’s nobody’s business but your own. For example, just say (hypothetically speaking) that I am an huge fan of Mills and Boon type romantic novels while pretending to my friends that my tastes are more intellectual. Is that really the business of anybody else other than me and my bookseller? What is wrong with me deciding to keep that secret, why should I not have the right to do so? Arguments that if I have the right to keep things secret then terrorists can’t be caught are lazy. Law enforcement agents need to discriminate which information they need to see. Privacy seems so old hat, people who don’t want to be on social media sharing the details of their life are seen as weird or past it. However, there is nothing wrong with choosing who you want to tell information to, without leaving a permanent record of it. 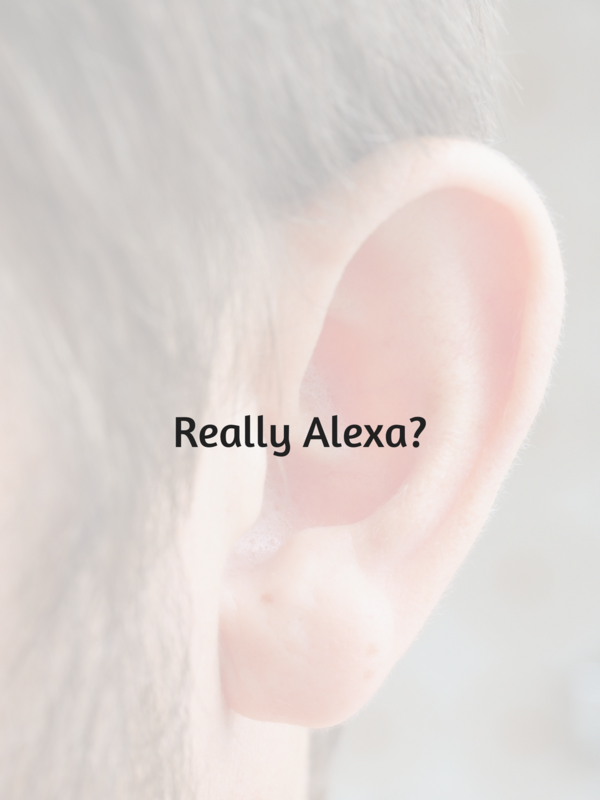 I know that I have given away a lot of information about myself already via my use of my computer and smart phone but for me a device permanently listening to everything happening in my house is a step too far. Maybe you are happy to share this much information about yourself. But are you sure that you are choosing to do it, not just falling into it because it never occurs to you to turn things off? What do you think? Are you comfortable sharing your personal information or are you concerned about how your information is being used? One of the most underrated techniques in running a workshop is just shutting up. Does this sound strange to you? You have pulled a workshop together to encourage people to share views and opinions and I am saying there needs to be less talking? What matters is who is talking. 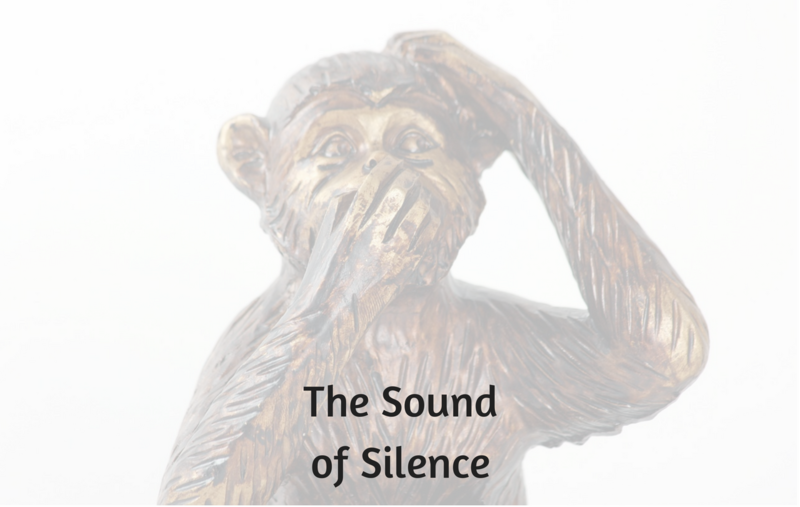 Sometimes, when a tech team works with a group of clients or stakeholders to understand their needs, the team won’t shut up long enough to let the stakeholders get a word in edgeways. But it can happen in any workshop, a single facilitator can just as easily take most of the air time. Why won’t people shut up? This is when a technical expert feels they need to keep demonstrating how competent they are by telling the client or stakeholders exactly how they do their job and reach their conclusions. 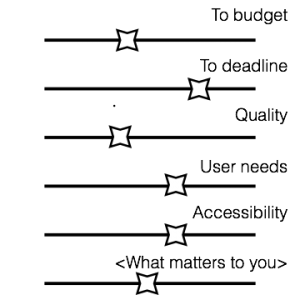 If a stakeholder is asked a question and does not immediately answer it is easy to assume that they didn’t understand, and launch into a repeated explanation. They might just be considering how to respond. Many people are very uncomfortable with silence. They learn, as they grow up, that conversation is about passing information between people and silence means the conversation has somehow failed. They say anything to fill the space. Not taking the opportunity to develop thoughts properly, can lead to requirements being missed at an early stage. Where a tech team does most of the talking the stakeholder frequently just ‘goes with the flow’. They agree to all suggestions discussed in the workshop but after they leave may feel they were steamrollered into making decisions. When they have had time to think through the implications they may find that the proposed solution is not quite what they want, and need to change things. To get proper buy-in people have to feel fully involved in decision making. Just being aware this is a possible issue is the first step. Watch the flow of conversation in the room. Are some people talking significantly more that than others, can some people not get a word in edgeways? Are people getting enough time to think? This adage dates back to Ancient Greece, but is as true at it has ever been. You learn more by listening than talking. Give the client or stakeholder time to consider what they have heard and come up with a reply. When dealing with new ideas or unfamiliar topics it can take people a little time to formulate their thoughts. Give them the space to do so. If one of your stakeholders hasn’t contributed yet, ask them for their opinion. Before launching into speaking again look at the other people in the room. What do their body positions and facial expressions tell you? Are they thinking? Confused? Bored? Making Notes? Sketching ideas? Playing on their phone? Respond appropriately. Make sure that your clients have enough time in a workshop to consider what they are being asked. Beware of people, especially the tech team, just talking to fill the space. A proper balance between talking and listening will make sure that decisions made in the workshop are fully bought into by everyone. Has this struck a chord with you? I’m interested in your views. At a recent conference of digital project managers in Manchester one question I heard asked many times was “How do you organise yourself to get things done? And the answer that came up again and again (from those that had an answer) was “Follow the principles in David Allen’s book Getting Things Done“. This has to be one of the most comprehensive books on personal productivity that I have ever read. It doesn’t just focus on managing your workload but takes into account that the things you are trying to manage range from tasks you have to do NOW all the way up to life goals. While most of us who use it conceded that we didn’t use all the approaches he describes, we had all taken away something from it that made our life easier and stopped us becoming overwhelmed. Get everything out of your head and written down. It doesn’t matter whether it is in paper or electronic form. Choose what works for you. Focus on identifying the step you need to take next for any of your goals or projects. This helps prevent you being overwhelmed by the magnitude of them. If something will take under 2 minutes, just do it. If you struggle with getting things done then I thoroughly recommend reading Getting Things Done and trying some of the techniques. Let me know what your favourite parts are! Having spent a number of years working in the pharmaceutical industry, I have often needed to work out the data privacy impact on the solution we were building. If you work in the finance or e-commerce domains I am sure you have done the same. But have you ever thought whether you should apply these same principles to your own work? Most projects view BA artefacts as ‘just another project document’, but is that correct? Why should you consider data privacy in your role? As a Business Analyst, you can, and should, develop open and honest relationships with your stakeholders. When I say stakeholder I mean it in the widest sense of the word. Both the people who are driving the change and those who are impacted such as end users, customers and support teams. Basically, anybody you may talk to in your role as project Business Analyst. To understand what the best solution is for your stakeholders you need to get the best information possible from them. For them to give you the best information they can, they need to trust you. They have to be able to honestly share bad things with you, as well as good things. When they share this information they may have a reasonable expectation of confidentiality or anonymity. Not every organisation welcomes honest feedback and in some environments, people use a Business Analyst to surface issues that they are nervous of raising themselves. What does Data Privacy mean? In the UK the law that controls how personal information is used by organisations is the Data Protection Act. Other countries have their own regulations and if you are working globally you need to understand laws that apply when sharing data between countries – I’m not going to go into that here though. The Information Commissioner’s Office has more details on definitions for those of you who are interested. How does this affect me as a BA? As a BA your key role is to elicit information from stakeholders, analyse and summarise it and then report it back to the steering group and project team members in a way that means they can agree on the next steps. If, as part of this, you store information that relates to an identifiable, living person on a computer then the Data Protection Act can apply to you. What data would I have that relates to an identifiable, living person? These contain your team’s assessment of stakeholders, for example, your understanding of who the key influencers are. If this does not match the accepted organisation hierarchy this may be sensitive information, especially in a highly political organisational culture. How can I manage my records well? If you are gathering answers from a group of people and you know you will not need to ask follow-up questions then refer to them as ‘Person 1, ‘Person 2’, etc. This can range from a brief verbal overview for in-house stakeholders to a formal statement of your data policy for external stakeholders. Unless stated otherwise, your stakeholders will probably have an expectation of some confidentiality. As a general rule, don’t share interview write-ups outside the project team. However interesting the content is! Stakeholder interviews and analyses are not ‘just another project document’. Don’t dump them on an open file share, limit access to those people that need to know. Consider restricting the interview files to just the BA team and any Stakeholder analyses to a core team. Make sure everyone on the team understands these files contain personal information and cannot be shared willy-nilly. Context is everything. Someone who doesn’t know the background for a discussion may misinterpret the content of a stakeholder interview. Some people record interviews with people so they can focus on listening to them rather than scribbling notes. (Note: Always ask permission to record an interview) Once you have transcribed the interview delete the voice files. They are no longer needed. Delete transcripts after you have analysed them and summarised and reported those analyses. For example, after a requirements document has been signed off or the relevant user stories have been created, estimated and prioritised. Managing your BA records properly is important to comply with legal requirements but also to show courtesy and respect for your stakeholders.